We've got a thing for Dublin at Copenhagenize Design Co.. Not least because we're involved - together with local partners - in three bicycle infrastructure projects in the city. Now we're loving them just a little bit more. Dublin has been doing traffic counts of people crossing the Cordon Canal towards the city's centre since the 1980s. The counts are done between 07:00 and 10:00 am and the Dublin Transportation Office has been collecting the data since 1997, releasing results on a yearly basis. The whole starting point of this analysis was to predict the evolution of modal share and to then compare it to the expected population growth. 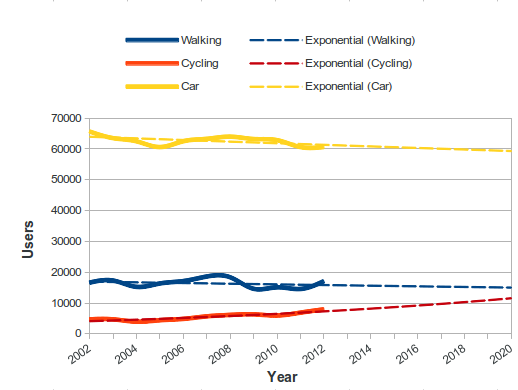 Thus, I wanted to correlate the population numbers evolution with the growth or reduction of three different types of transportation: walking, cycling and by car. First of all, this is the expected population growth for 2020 in Dublin. Dublin's expected population growth 2002 - 2020. In the upper left-hand corner we can see that the expected population in 2020 is almost 180,000 inhabitants, whereas the population for 2002 was close to 100,000. Thus, two particularly important dates are withdrawn from these data: 2002 and 2020. If curiosity killed the cat, then data drove the analyst insane...ly happy. In other words, I needed more facts and had questions that needed answers. For instance, how will the modal share evolve considering the population is expected to grow as much as 80,000 in 18 years? Is increasing the number of roads towards cities' centres a future-oriented solution? Dublin is extremely proficient in collecting data that helped with the answers. Perhaps, in some other cities in the world, if the population is expected to grow, more car infrastructure will be priortised. In this case, however, the city opted for the implementation of a great bicycle share programme - one of the most successful in the world - and a countless number of other pro-cycling policies. But let's keep calm and geek on. Considering those two important dates – 2002 and 2020 - I've assembled the numbers for walking, cycling and cars entering the city centre based on the existing data. Then, I created a trend line (also known as linear regression) to help understand where are the numbers going after 2012 (the last public data). Dublin's modal share (sources 1 & 2) and trend lines. The thick solid lines represent existing data and the dashed ones represent the trending lines. As you can see, the number of cars entering the city centre has been decreasing in the past few years. Thus, the dashed lined represents the future trend – increasingly lower throughout the years. However, the same is happening for pedestrians which could be read as a warning for future policies. 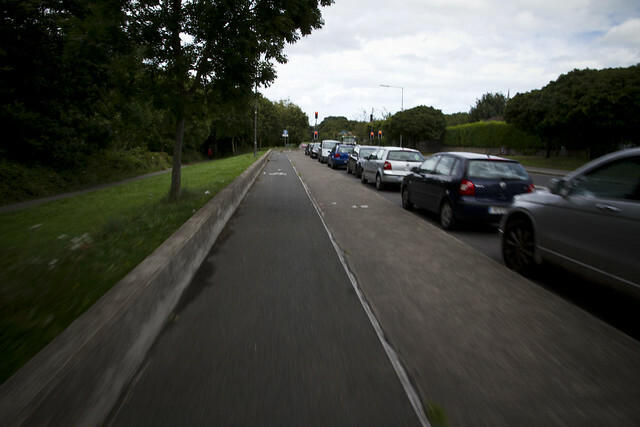 Cycling however, has been booming: according to the Report on trends in mode share of people crossing the Canal Cordon 2006-2011 the number of cyclists entering Dublin City increased 42% between 2006 and 2011. This report goes on to present this number as a result of the implementation of several cycling policies and the success of the city's own bike share scheme, Dublinbike. Indeed, a successful and worthy case study. Generally, one of the most common actions taken to tackle population growth in city centres is a hopelessly old-fashioned one. Building more roads for cars, increasing the number of parking spaces and enhancing pro-car policies. The new city has no money for that, or the space or the time. Dublin is showing everyone how to be a future-oriented city by doing it as you read this – and even long before this article was written. And then we have current Copenhagen case. The City of Copenhagen is also expecting a rapid population growth. 100,000 extra inhabitants by 2025. How has Copenhagen been planning to deal with this population growth? Cancelling a proposed congestion charge - despite hard evidence from many cities that it would work - and planning a monstrous and expensive new tunnel for motorised vehicles that will increase the number of cars entering the city centre. Furthermore, they continue to ignore the 6-8 lane expressway - Hans Christian Andersen's Boulevard - that slices through the city centre and the current Lord Mayor, Frank Jensen, is putting back in car parking spots after many years of removing them. And so on. It's more than two steps back, considering this is the city of cyclists. But like we've said before... welcome to the New Copenhagen. Which is why looking at a modern, visionary city like Dublin is refreshing and optimistic. Not to mention inspirational. I've not yet had the chance to visit the city of Dublin but I love it already. As a data geek but also as a bicycle user and an urbanite.